As promised, here I am with another recipe. It seems like I don’t post nearly enough of those. I’m working on it, I swear! Easter is nearly upon us and with Easter comes Easter lunch. I volunteered to bring the desert (naturally) and since we’re feeding 20 people and they all have different tastes, I’m taking a desert assortment instead of something large and impressive, which is the route I usually choose. This pound cake is one of my choices. 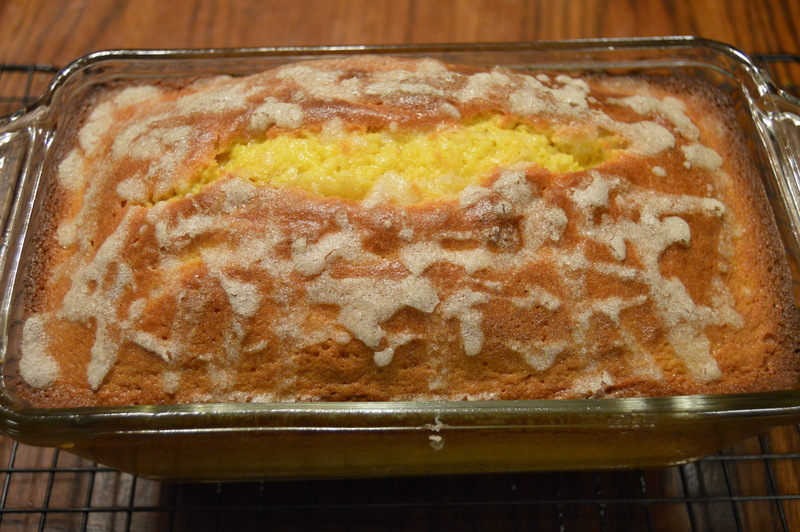 The first time I made this pound cake it disappeared in record time. It’s crispy topping is a perfect complement to the dense texture with the just the right amount of sweet and a lovely citrusy/vanilla flavor. With Strawberries starting to make an appearance at the grocery store, it would be a shame not put them to good use as a topping for this delicious cake! Here we go! First things first, preheat your dang oven! 350 degrees here. Pretty much the standard temperature for baking ANYthing. 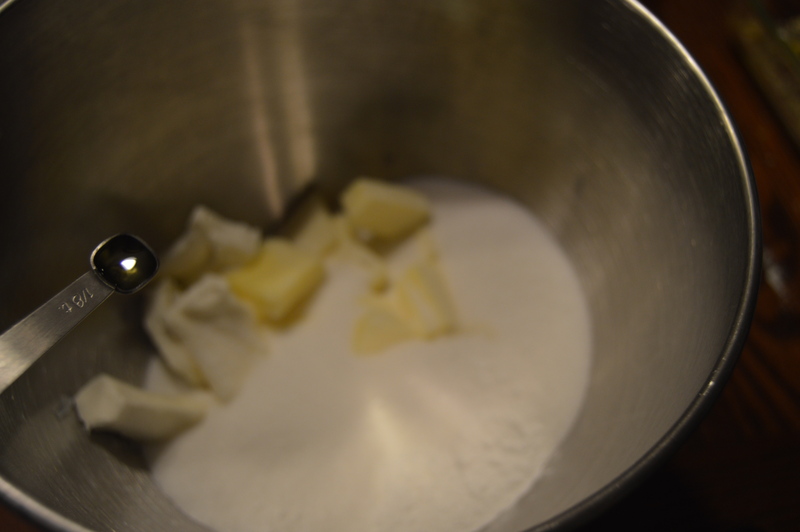 Next, combine butter, cream cheese, sugar, baking powder and salt in a mixing bowl. Add flavoring of your choice. I chose to use Fiori di Sicilia, which is an Italian-inspired citrus/vanilla-y flavor I purchased from King Arthur Flour. If you don’t have the Fiori di Sicila, you can use a combination of vanilla and almond extracts and I’m sure it would be just as yummy! Cream all of the ingredients together until well combined. Add eggs one at a time, beating well after each addition. 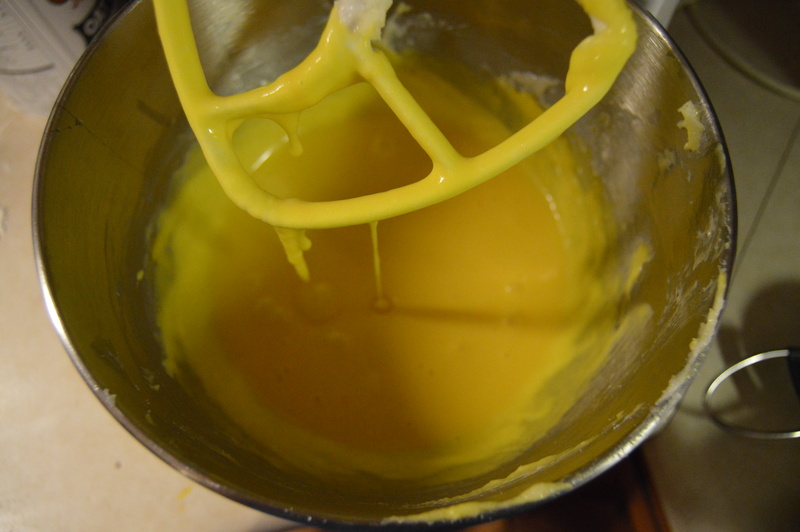 Your batter will be a lovely yellow color and should drip off of the beater in a thin stream. At this point you’re supposed to crank up your mixer and beat on high for 3 minutes. I did this and batter went everywhere, even with my splatter shield. 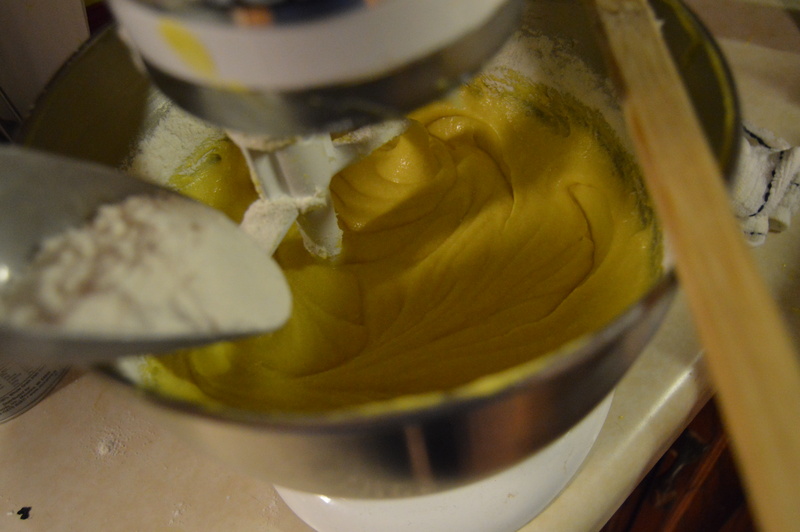 After losing what seemed like a good portion of my batter, I turned the mixer down so as to not lose anymore. I think the farm fresh eggs I used were more on the extra-large side than large so that may account for the runniness (not a word, sorry) of my batter. 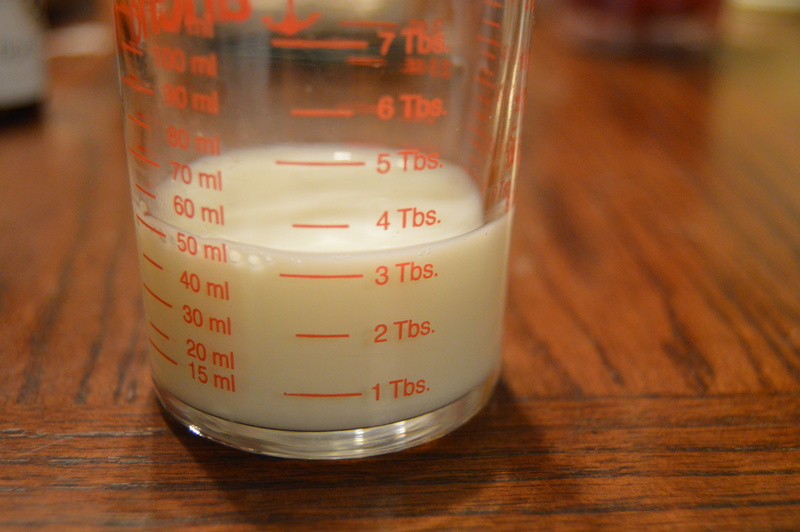 Next, measure out three tablespoons of milk. Add it to the butter/egg mixture. The milk will make it even more runny! If you have cake enhancer, add it now. Cake enhancer helps a cake stay fresher and more moist for longer. I don’t always use it but this recipe called for it and I had some laying around waiting to be used so I went for it. Cake enhancer is totally optional. Now add the flour. You can’t have a cake without flour! Unless you’re having a flourless cake. Oh, nevermind. Just add the flour and beat it well. The batter will be very thick! 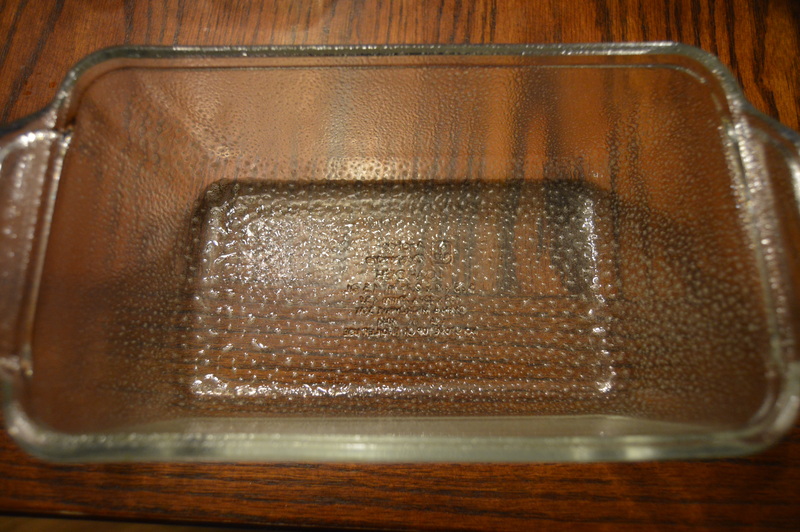 Grease your 9″x5″x2″ pan with a hefty amount of cooking spray. You can also use butter, I’m sure, but I’m lazy so spray it is. 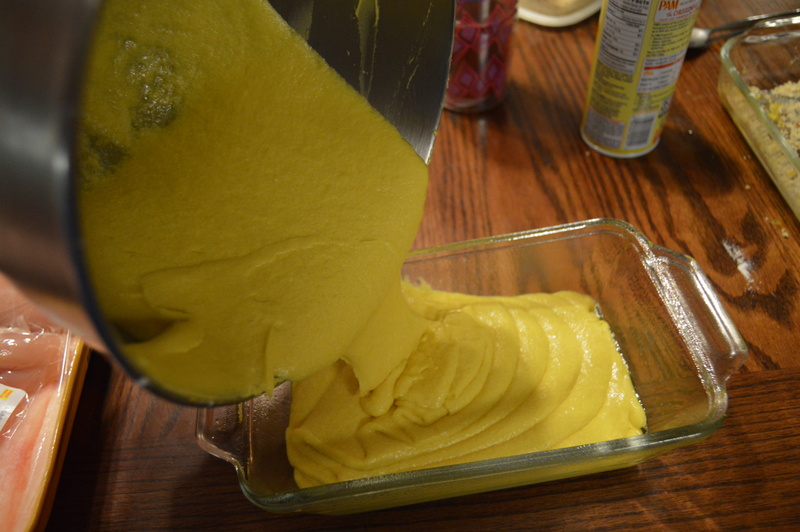 Pour that thick, luscious batter into your greased pan. Place said pan on baking sheet just in case there is any spillage. You definitely don’t want to clean out your oven. I know I don’t. King Arthur wisely assures us that as long as you use the correct size pan that you shouldn’t have any over flow but I’m not taking any chances. Like I said, I’m lazy. While the cake is baking, combine sugar, water and vanilla in small bowl or measuring glass. Give it a good stir until it becomes syrup-y. I really like hyphens. Have you noticed that? 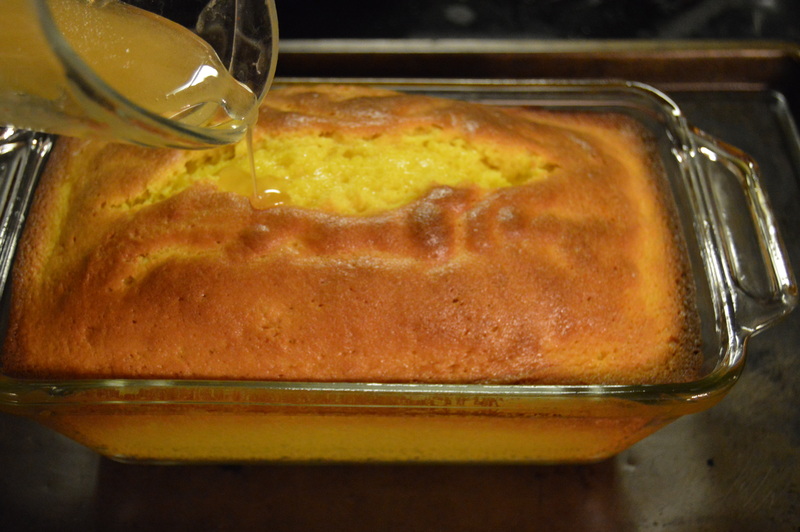 After the cake has baked for 55 minutes, pull it out of the oven and drizzle the syrup mixture on top. Return the cake back to the oven for another 15-20 minutes. Preheat oven to 350 degrees and grease your pan. 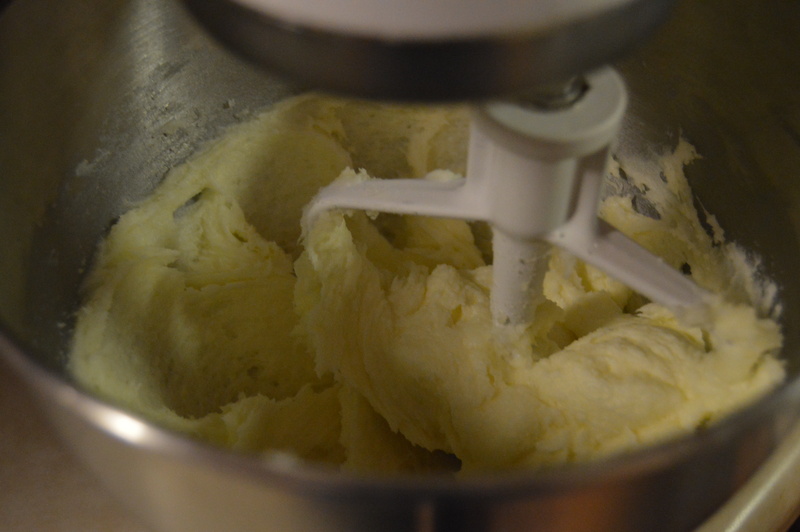 In the bowl of a stand mixer combine butter, cream cheese, salt, sugar, baking powder, and extracts. Beat until well combined. Add eggs one at a time beating well after each addition. Once you’ve added the final egg, beat on high speed for three minutes (Warning! 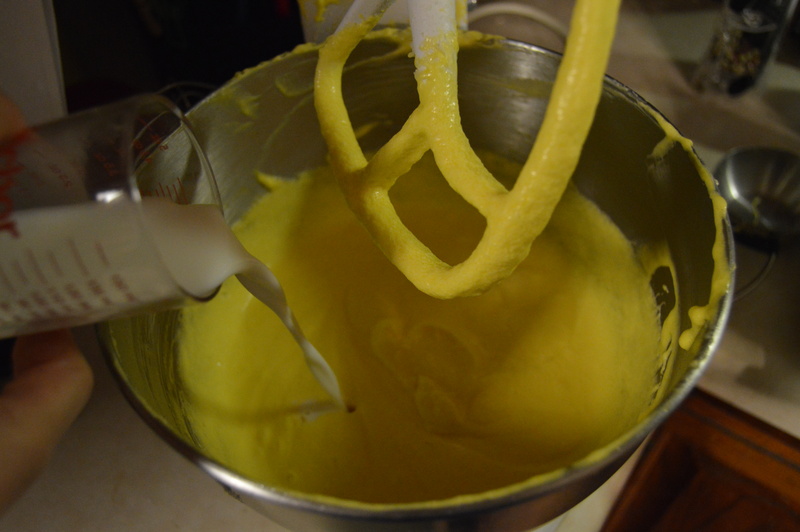 This part can be messy if your batter is really runny!) then reduce the speed and add the milk. 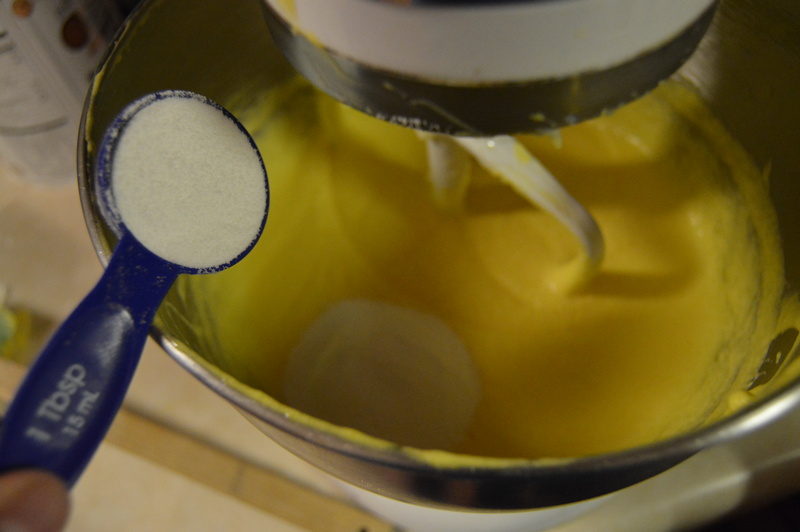 If you’re using cake enhancer add it now then add the flour gradually while mixing on low speed. 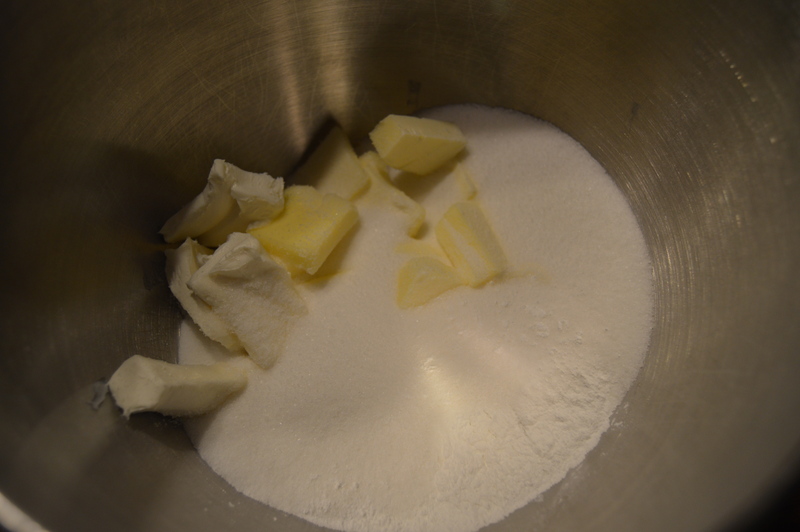 Don’t forget to scrape the sides of the bowl along the way to incorporate all of the flour. Pour the batter into the prepared pan and place pan on a baking sheet (just in case it overflows!). Bake for 55 minutes. Once the mixture is in the oven, combine the sugar, water and vanilla extract. 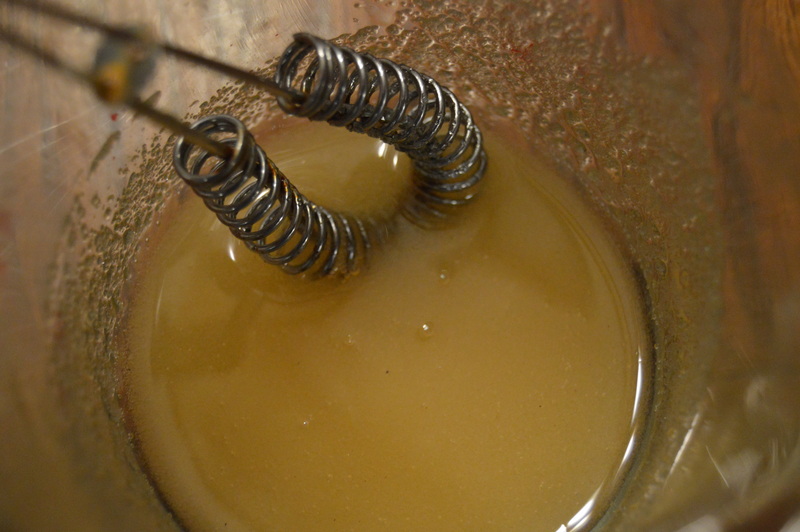 Stir it until a syrupy mixture forms. 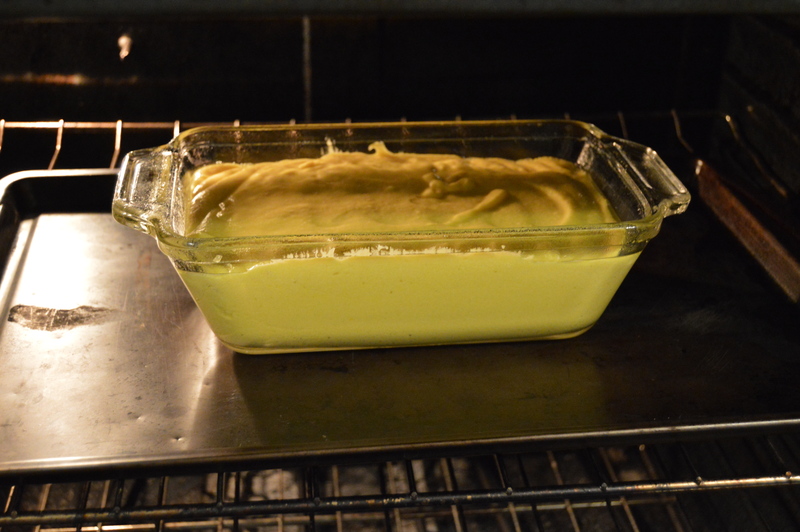 After 55 minutes is up remove cake from oven, drizzle or brush on the syrup mixture. Return the cake to the oven and bake for 15-20 more minutes or until a toothpick inserted in the center comes out clean. Let cake cool for about 5 minutes then remove it from the pan, after loosening the edges, and turn it out onto a wire rack to cool completely. 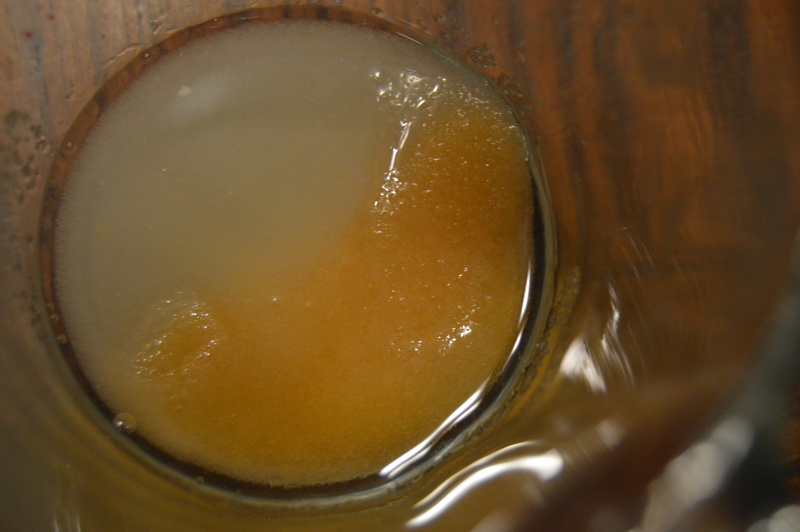 Notes: Instead of vanilla and almond extract, you can subsitute 1/8 tsp of Fiori di Sicilia. You don’t want to use any more because it is potent stuff. Seriously, a little goes a long way. I’ve had the same bottle for three years now and I’ve only used about a fourth of it. Also, the King Arthur site has some good tips for making sure the cake is done or using other pans. You can see those here if you’d like. Thank you so much for reading! I hope you all have a Happy Easter! Until next time, keep on baking! !